Thorniewood returned from Port Glasgow on Saturday following a rather frustrating 1-1 draw against the current Central Second Division leaders, writes Stuart Clelland. Early action on Parklea Stadium’s 3G surface saw home keeper Craig Beaton fingertip away a Damon Welsh cross as United striker Chris Lennon lurked at the back post. But Thorniewood took a 23rd minute lead when a flowing move involving John Paul McBride, Chris Jackson and Craig Forbes ended with home defender Aidan McMillan handling with Lennon stepping forward to crash the resultant penalty home. ’Wood joy was shortlived however as Lennon then received a straight red after 28 minutes after Port defender David McGariggle went down following an off the ball incident. In the 38th minute Thorniewood forward Johnny Logan connected with a Forbes cross only to see his header somehow stopped by a Beaton elbow on the goal-line. After around an hour, with both sides tiring, the game began to come to life and substitute Stefan Law just couldn’t produce the finishing touch after Logan and Jackson had combined. Moments later a great chance fell to Thorniewood when a poor Beaton clearance was pounced upon by Logan only for his first attempt to be blocked by the keeper before he smashed the rebound wide. Port were then reduced to 10 men in the 75th minute after Steven McAfee was sent off. 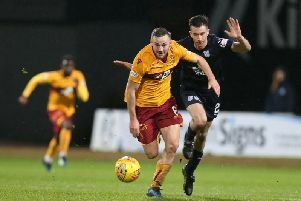 How Ironic then for ’Wood, with the sides now numerically even, to concede from the free-kick when Craig McCormick’s delivery was headed home from 12 yards by the unmarked Gary Pettigrew. Thorniewood could and should have won when a 92nd minute Andy Sinclair thunderbolt from 20 yards was superbly saved at full stretch by Beaton before in the last seconds a Graeme Watson corner was headed over by Damon Welsh.